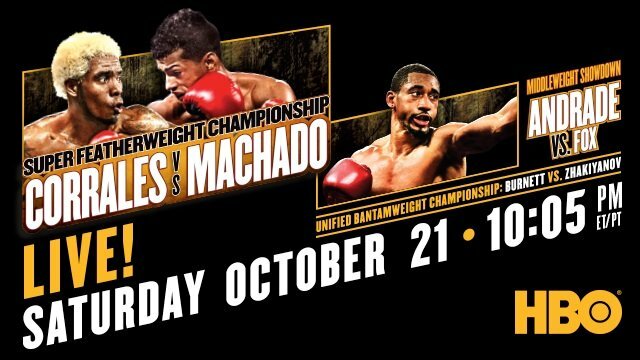 The boxing action heats up when HBO BOXING AFTER DARK: JEZREEL CORRALES VS. ALBERTO MACHADO, DEMETRIUS ANDRADE VS. ALANTEZ FOX AND RYAN BURNETT VS. ZHANAT ZHAKIYANOV is seen SATURDAY, OCT. 21 at 10:05 p.m. (live ET/tape-delayed PT) from two locations, Turning Stone Resort Casino in Verona, NY and SSE Arena in Belfast, Northern Ireland. The HBO Sports team will call all the action, which will be available in HDTV, closed-captioned for the hearing-impaired and presented in Spanish on HBO Latino. In the main event from Turning Stone, Jezreel Corrales (22-1, 8 KOs) of San Miguelito, Panama takes on Alberto Machado (18-0, 15 KOs) of San Juan, Puerto Rico in a scheduled 12-round super featherweight title contest. Corrales, 26, who has spent the majority of his career in Panama, is fighting in the U.S. for only the second time and making his third title defense. His only ring loss came in 2009, in his second pro bout. Last July, Corrales defeated the formidable veteran Robinson Castellanos to set up this encounter with the unbeaten Machado. Known for his power, the 27-year-old Machado has an 83% knockout-to-win ratio and has been rising through the ranks of the 130-pound division. He previously scored a convincing decision victory over Carlos Morales and now faces his first shot at a title. The co-main event from Turning Stone is a battle of undefeated fighters, as Demetrius Andrade (24-0, 16 KOs) of Providence, RI takes on Alantez Fox (23-0-1, 11 KOs), from Forestville, Md., in a scheduled 12-round middleweight contest. Two-time junior middleweight champion Andrade, 29, is moving up in weight class to battle Fox, 25, in a showdown both fighters hope leads to a title fight. A member of the 2008 U.S. Olympic Team, Andrade has a deep amateur resume, having won a gold medal at the 2007 AIBA World Boxing Championships. The six-foot-four Fox will look to exploit his height advantage over the six-foot-one Andrade. The night opens with a same-day, tape-delay presentation of the scheduled 12-round bantamweight unification bout at SSE Arena in Belfast, Northern Ireland between undefeated hometown favorite Ryan Burnett (17-0, 9 KOs) and Zhanat Zhakiyanov (27-1, 18 KOs) of Petropavl, Kazakhstan. Burnett, 25, is putting his title and perfect record on the line against fellow belt-holder Zhakiyanov, 33, who has compiled a 22-bout win streak since his only ring loss. The fight marks HBO Boxing’s first visit to Northern Ireland. You are here: Home / Press Room / Andrade-Fox, Corrales-Machado & Burnett-Zhakiyanov on Sat.